By Sunday both of our wonderful communities were abuzz with info about Josh Tickell's film FUEL. Farilla contacted Rebecca Harrell for free tix to Sunday evening's screening in Santa Monica. It felt really good to support such a positive film about solutions to America's oil addiction. FUEL screenings have been extended another week in Santa Monica due to grassroots efforts. w00t!!! And even more screenings will be opening across the country in the next few days. 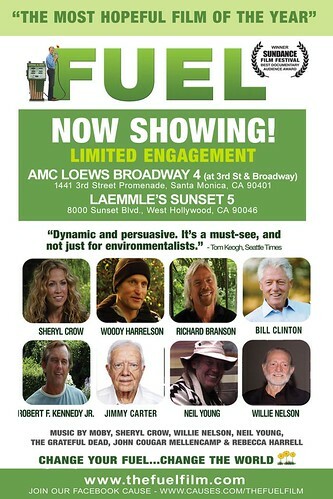 The film needs 2,000 viewers here in LA in order to get national distribution. Please support this documentary by watching it and helping to get the word out. For FREE tickets to see FUEL this Friday (2/20) @ 7pm in Los Angeles/Santa Monica send and email entitled "ABUNDANCE 2" to rebecca@thefuelfilm.com. Change Your Fuel, Change The World!